Shorter term price trends operate within longer term price trends. When short-term price trends break down in succession, long-term price trends become threatened. We have seen a sequential breakdown in short and intermediate term price trends for the stock market. The key long-term support for the bull market’s price trend is set to be tested this week, i.e. the bull market is in jeopardy. I have discussed the #crash2020 scenario for about a year now. The underlying themes of my argument are that a tightening Fed, a high and rising Federal deficit, diminished returns from trickle down tax cuts and belligerent trade policy would trigger a recession by early 2020 with a corresponding stock market crash. As it turns out, I might have been late to the party, not early. The stock market appears to be anticipating far earlier than I thought would happen, the problems the Trump economy and stock markets face. Today, I’ll focus on the price trend analysis. Why? Because, ultimately, the price trend tells us a lot about how impactful the rest of our analysis will be. It can sometimes tip us off to being wrong, or more often, being early or late to buy or sell. Over the past eight weeks, the stock market has burned through short and intermediate term support levels. The next two weeks will be pivotal for the stock market one way or the other: either we see a rally, the kind that induces FOMO, or we see the bull market rising price trend ended. If we see the bull market price trend ended, then we are likely to see a bear market that leads to counter measures taken by the Federal Reserve. Whatever happens short-term, we are going to want to zig when everybody else is zagging. I have posted charts similar to this a few times now. Here are the updates from Friday’s close. 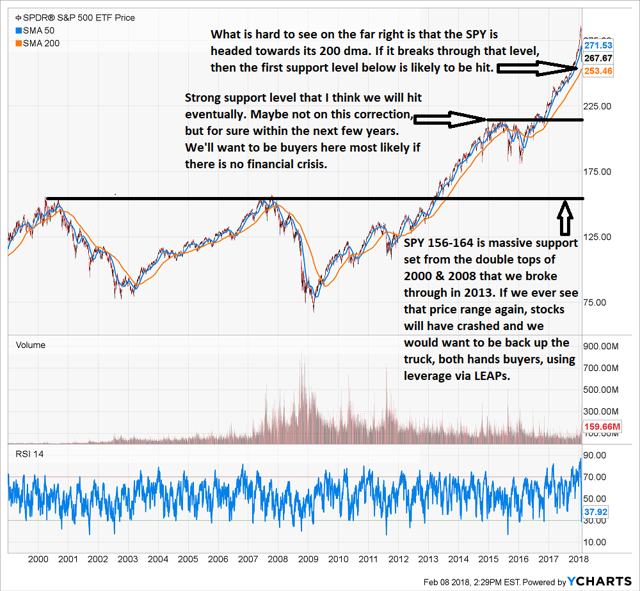 We can see what looks like a triple bottom forming in the SPY chart. However, we have to be careful. The last leg down might not be complete. If the SPY rallies, it will likely run to about 275 and then face another decision, whether to keep rising or retreat to the lower level again. We also see the Chaikin Money Flow turning over again. When it began to rise short-term, the stock market followed it up before retreating again on apparent sympathy to trade news. That apparent sympathy might just be masking something more important though: a Federal Reserve that just doesn’t get it. 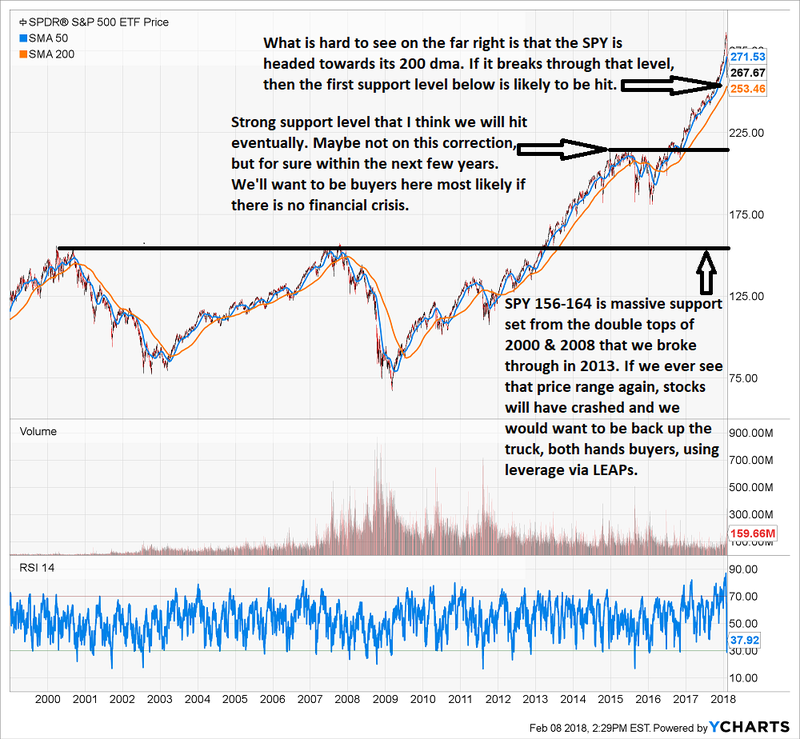 I have identified $259.30 on the SPY as a very key support. The first test, represented by the first portion of the possible triple bottom, did in fact fall to $259.85 and held. We need to see $259.30 hold this week come Friday or the following week could confirm the downtrend and much lower lows. 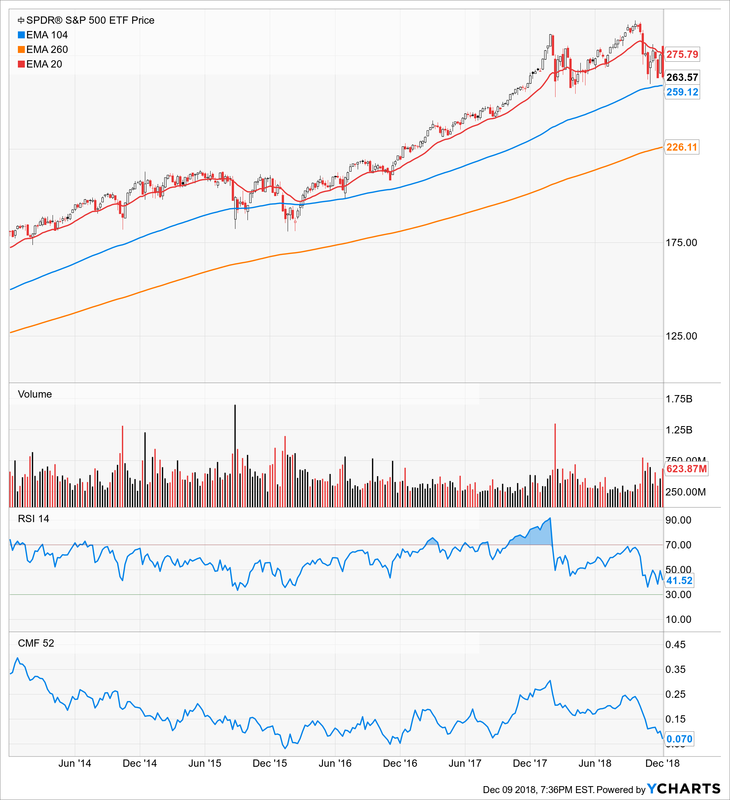 For longer-term trends I use the exponential moving averages because those weight recent price trends heavier and a weekly chart vs the noise influenced daily (or by the minute) charts that traders use. 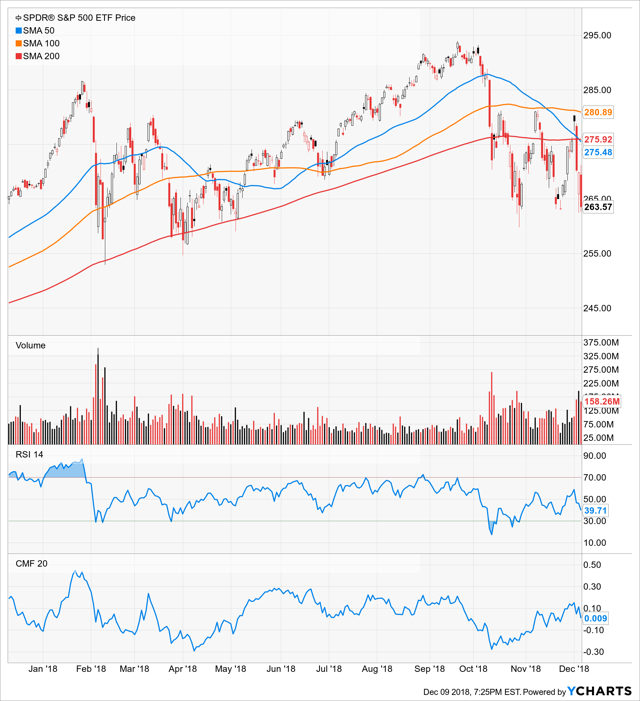 The moving averages are moving down due to the current downward stock market pressure. You can see that the exponential moving average, which represents a strong support area is close to breaking. It is a bit lower than it was a week ago, but not much. $259 is still the key price level we don’t want to see broken to end the week. When a major support level is broken to end a week, and it is confirmed lower the following week, that generally means further support levels will be approached. The Chaikin Money Flow on the weekly chart has been getting crushed lately. This would imply further downside unless there is a sudden influx of buying. Who would be the marginal buyers to give us that buying. As we discussed a few months ago in It’s Time To Be A Stock Seller, it is no longer the Chinese or money flowing in from QE that would be the maringal buyer creating demand. I had supposed recently that the record corporate buybacks would be enough to offset the Fed pulling back. Apparently, that is wrong unless the Fed suddenly and unexpectedly pulls back. Traders are very powerful right now as they are remaining marginal buyer or seller in the market. Could they look at the current stock market levels as a potential reversal point and pile in so as to push prices higher? Maybe, but I think they are more likely to try to break things more because that might be the path of least resistance with a Fed that, in my opinion, just doesn’t understand the deflation, not inflation, is the bogeyman. You can see that the support rests at the about the spot where the moving averages would get to should the stock market keep falling. That’s quite a way lower to the middle $220s. Again, falling to that level would normally be a process. However, that process could be much faster than anticipated given the structure of the exchange traded funds market. 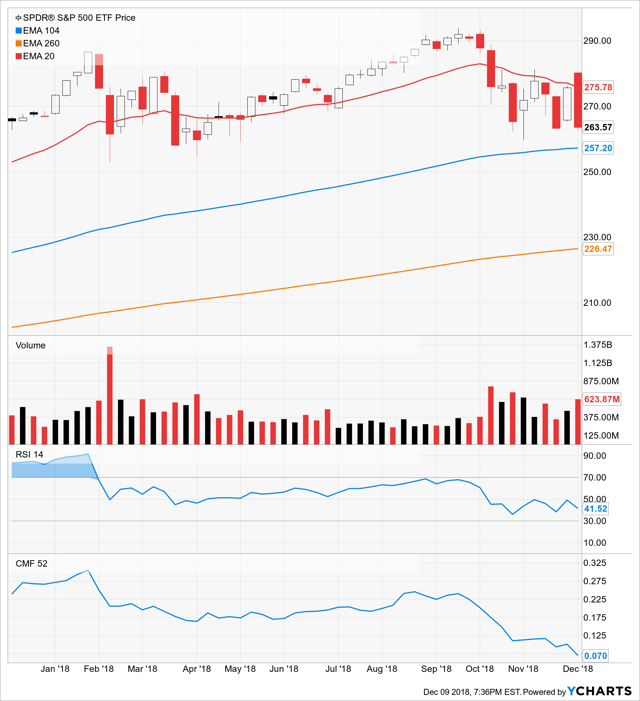 If ETF owners start to panic and sell, then the market could spiral down very fast. That means investors have to make a decision. Either sell very quickly, or just await the inevitable rebound. In other words, if you miss your escape early, just buckle up and let time fix things. Because I manage other people’s money, my plan is to keep an eye on these markets very closely. If we are breaking more support levels, I will raise more cash. Already, I have taken profits on one trade of a well known electric vehicle company. I also am starting to trim holdings in the PowerShares QQQ ETF (QQQ). Not because I do not like that fund, I think it’s the best diversified new economy ETF out there, however, it too is up against technical challenges and cyclical issues with semiconductors. If we see a face ripping rally, and there is no significant change in course from the Fed to slow their reduction of their balance sheet, then I will look for a spot, likely starting around the 100dma, to lighten my ETF assets into strength. So, trimming some QQQ to raise cash to reinvest in QQQ or favorite stocks later,is a viable strategy. I am holding my favorite stocks and have no intention to sell those long-term holdings. I am also not selling my oil and gas holdings as I believe that will be one area of strength in the stock markets. More on that tomorrow.